We have seen various slots with different animal themes and now it’s time for a slot particularly based on the giant Elephant developed and designed by the famous slot developers IGT (International Game Technology). 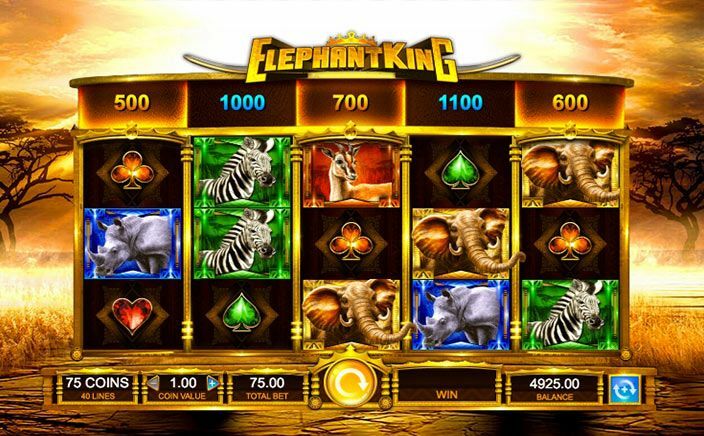 The slot is named Elephant King. It has 5 reels, 3 rows and 9 paylines. Play this slot with a minimum of £0.75 per spin. Elephant King is a slot set in a backdrop of Jungle and has opaque reels with amazing elephant sound effects in the background. The slot gives you big payouts and many ways to win with small bet amount. This slot very much similar to other slots from IGT in design and concept but once you will start playing the slot you will realize various new features have been added in this slot. Prior to the gameplay, you must set the bet amount and once you are ready you can start spinning the reels. You can also use the auto spin button. You will see a lot of animals during this safari which is also the symbols in the slot and those are a zebra in green background, a giraffe in the orange background, a hippo in the blue background, an elephant in the golden background, monkeys and the tiger. Other than these animal symbols there are various stones in different colours which include a red coloured heart, an orange spade and a blue pearl. The elephant with a golden circle in the background is the wild symbol which can substitute for all other symbols except for the scatter symbol. There are not many special features in the slot but these can give you a lot of cash prizes in return. The Wild Symbol: To play 5 free games, land 5 wild symbols anywhere on the reels and all the wins during this is doubled. Bonus Game: Land 3 Elephant King symbols on the middle three reels which are 2nd, 3rd and 4th. This round will be introduced by the giant Elephant appearing in the middle of the display with the trumpet sound in the background. Every re-spin during three free spins will give you cash prizes. This round guarantees big wins. 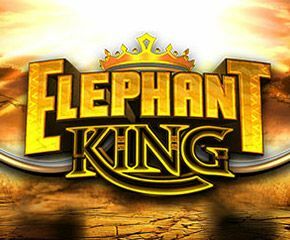 Elephant King is a slot which can give you great returns on small bet amount. So, if you have a small budget, then Elephant King is the best choice for you. The sound of an elephant in the background and shivering of reels with every win will give you an amazing aura throughout the gameplay.